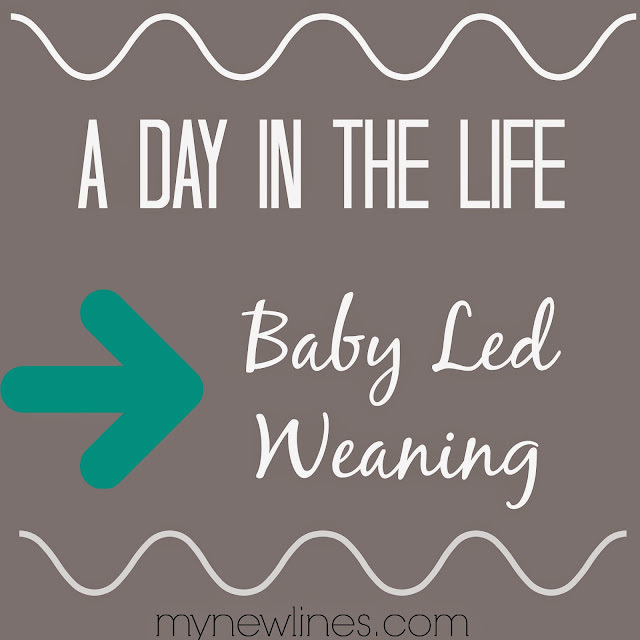 Before JaiseAnn was born, I had decided we would go the baby led weaning route. This method of introducing babies to solid foods allows them to wean at their own pace. Just after JaiseAnn hit the "six month mark" we decided to introduce her to solids. She was at the right age, she seemed to be showing interest, and I was ready. We started and I realized that I felt a little lost. JaiseAnn had very little interest in solid foods, eating whole foods made me nervous that she would choke (even though I had read and read about that), and I just felt like we weren't moving along. I didn't feel like JaiseAnn was eating like a "normal" baby and our day didn't have a "normal" feel to it. JaiseAnn loves solids now and has a few favorites. We are kind of in a routine and I feel like I can offer something to those of you just starting out or wanting to start out. I won't get into the knitty gritty of Baby Led weaning. These two sites are so informative if you have questions about baby led weaning: Baby Led Weaning and Baby Led Weaning Ideas. I also found this post very helpful. Please note that when JaiseAnn was first starting solids I fed her ONE thing per meal (to check for allergies and how she responded) and she honestly didn't really take to any of it. I would offer her an avacado for every meal and then make sure she didn't have an allergy. The next day I would offer her sweet potato. I offered carrots the next day, and so on. Eventually I got more and more comfortable with what I was offering JaiseAnn and she got more comfortable with solids. It did click eventually--so if you have a baby that just doesn't seem interested--there's hope. JaiseAnn just needed time and I'm glad we didn't force her. *JaiseAnn wakes up and nurses (even though we co sleep and she JUST nursed before we got out of bed). *When JaiseAnn wakes up from her nap, I nurse her. *Lunch--This is the only time JaiseAnn and I don't eat the same things. I have a smoothie made with a protein mix for lunch and JaiseAnn has leftover dinner from the night before. I don't usually warm it up because she eats her food pretty cold as it is. *JaiseAnn will nurse another time before she takes her second nap. *Dinnertime. This is JaiseAnn's favorite meal. We literally just give her whatever we're eating for dinner. I put some aside and let it cool before piling food on our plates. I am laying out an example of our dinner for one week and what JaiseAnn eats. Monday--Chicken stir fry--cooked in sesame oil and garlic with no sauce, brown rice, carrots, and broccoli. JaiseAnn will get a spoonful of rice, a few pieces of chicken, a few pieces of broccoli, and a few pices of carrot on her tray. She will eat just about everything here. Tuesday-Turkey burgers--grilled on the George Foreman, served with roasted potato wedges (sometimes other veggies), and mushrooms. I usually make two or three tiny patties for JaiseAnn (one is for the next day's lunch) and serve her the patties with a few potato wedges and mushrooms. Wednesday--Baked Chimichangas. I usually don't serve these with anything else. I give JaiseAnn a few spoonfuls of filling and a few pieces of whole wheat tortilla. Thursday--Skinny Chicken Parmesean--I usually serve this with this homemade spaghetti sauce (packed with mushrooms minus the meat) over zuchinni noodles. I serve JaiseAnn a few pieces of the chicken, some sauce (including mushrooms), and a few zuchinni noodles. She loves zuchinni and the sauce so this meal is a big hit at our house. Friday--Beef Stew--I will strain a spoonful or two of the stew and rinse it off for JaiseAnn. She will eat pieces of meat, potato, pea, carrot, and celery. Ssaturday--One Pan Chicken Dinner--I will rinse the seasoning off of the chicken, potatoes, and green beans that I give JaiseAnn to reduce the sodium in her meal. Green beans are her favorite, so she will likely eat a lot for this meal. Sunday--Meatloaf--served with roasted veggies and baked apples. I will give JaiseAnn a few pieces of meatloaf (if there's a glaze on top, I usually remove that) and I serve her the roasted veggies and baked apples. JaiseAnn is able to eat (and enjoy) all of the meals I've included at 9 months old without any teeth. It took us some time to get to this point, but having JaiseAnn be a part of our meals and developing a healthy relationship with food is so important to me.